All around the jagged coast of Washington’s Kitsap Peninsula, waves lap at the shore. The tide ebbs and flows, receding as much as 15 feet in some places. Ripples reflect the sunlight, dazzling kayakers as they dip their paddles into the surf and whisk them back up again, waving at the sea in cheerful greeting. In the distance, between the nose of their boats and the Cascades in the east or the Olympic Peninsula in the west, porpoises frolic and, just maybe, a humpback will surface and spray a puff of salty air into the sky. The Kitsap Peninsula is a mere ferry ride away from the traffic and noise, the quickened pace of life in Seattle, but a galaxy apart. Here, visitors come to commune with nature—a walk in the woods, a mountain bike speeding down miles of single track, a paddle around Kitsap’s some 371 miles of coastline. Here, visitors come to commune with nature—a walk in the woods, a mountain bike speeding down miles of single track, a paddle around Kitsap’s some 371 miles of coastline. It’s that coastline, with its chiseled inlets and 200 possible access points, that attracts not just adventurers beckoned by the song of saltwater waves, but the National Park Service, too. 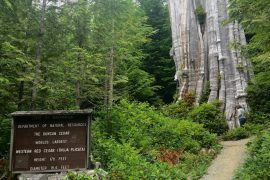 The waterways surrounding this peninsula are now officially recognized alongside the Appalachian Trail and the Pacific Crest Trail—the first-ever saltwater National Water Trail, so dubbed in 2014. For a peninsula peppered with small seaside towns and far from bustling highways, such a prestigious recognition is significant. “It creates in people’s minds a destination,” said John Kuntz, president of Olympic Outdoor Center. He’s been promoting the world-class waterways surrounding the Kitsap Peninsula since he first paddled the 150 miles around it in 1996. In 2008, he joined the North Kitsap Trails Association and started the process of garnering the area’s liquid assets the attention they so richly deserve. 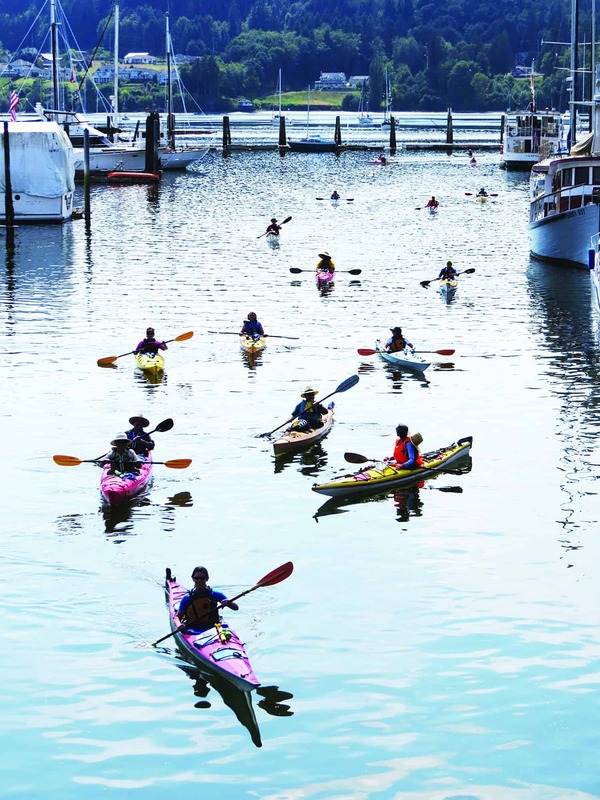 Thanks to community and local government support and marketing initiated by Visit Kitsap Peninsula, Kitsap’s waterways have become a destination in their own right. The minute you push past the shoreline you’ll feel the immensity, the vastness of the natural world—the mountains in the distance, the sticky saltwater breeze on your face, the tap of the waves on the hull of your craft, harbor seals lounging on the rocks, bald eagles taking flight, orcas cresting in the distance. It’s almost too much to take in. On the scores of beaches speckling the coastline there is climbing and oystering, playgrounds and waterfront eateries. One of Kuntz’s favorite outings involves paddling from Poulsbo to Keyport for lunch and back. But it’s not just kayakers who are invited to enjoy the water trails. Stand-up paddleboards, canoes, kite boards, any beachable craft can enjoy access to the waterfront. 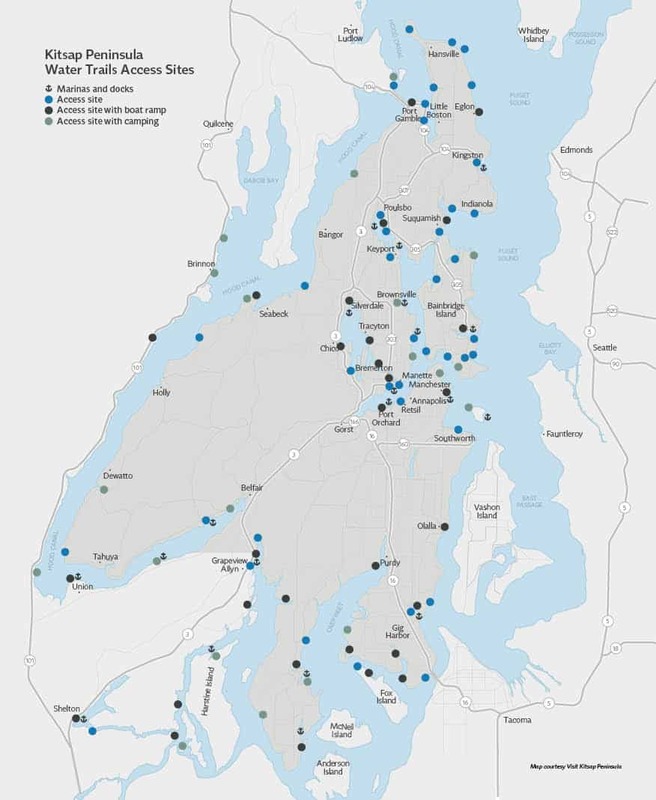 Kuntz, together with Patricia Graf-Hoke, director of Visit Kitsap Peninsula, even created an interactive online map in 2018 marking eighty-four of the most accessible access points around the peninsula, pointing locals and visitors to the best places to launch or dock. 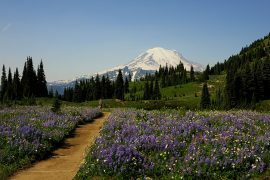 Among them are points in west-facing Seabeck, Bremerton and Port Orchard that offer spectacular sunsets with the Olympic Peninsula as the grand backdrop, and Bainbridge Park, where the sun rises over the hazy Seattle skyline. From Port Gamble you can paddle all the way up to Canada or simply stop for shopping and a bite to eat in the quaint waterfront town. Blake Island, accessible only by tour or private craft, offers a Native American village, hiking and scuba diving. Poulsbo is home to one of the area’s largest harbor seal rookeries, and in Olalla, paddlers often stop for pizza and beer at Al’s Market. 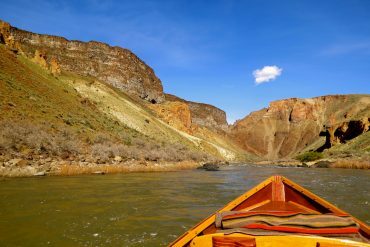 “You’re really never far from a place you can paddle to,” Kuntz said. Once a year, there’s even a celebration of sorts for those who know and love the water trails, as well as those experiencing them for the first time—Ride the Tide. 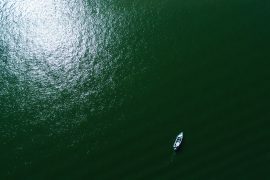 The event guides participants from the Tracyton Boat Ramp through the Port Washington Narrows and to Port Orchard, a 6-mile journey that lasts two to three hours. It’s just as easy to paddle on your own with the interactive map. To find an access point, simply visit www.kitsappeninsulawatertrails.com/maps and click on the markers to see details, including directions, descriptions, amenities and nearby recreation, from camping and hiking to shopping and dining. You can even filter results by the type of activities you’d like to participate in after you dock. It’s a resource that has opened the area, allowing visitors to enjoy all of Kitsap’s natural wonders alongside the residents who known and loved these welcoming waterways for decades.